Did you know, Americans spend more time in the laundry room than in the bathroom: an average of eighthours a week, collectively doing some 35 billion loads of laundry a year. And yet, while bath design has evolved into a discipline of its own, and the space into a bona fide retreat with soothing soaker tubs, the laundry is often relegated to a basement, separated from the life of the home. 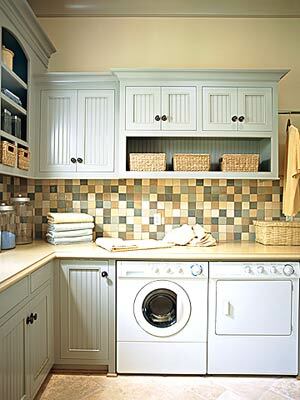 Increasingly, though, homeowners are creating laundry rooms that are as integrated as a bath or the kitchen. They can even be in a bath or kitchen. 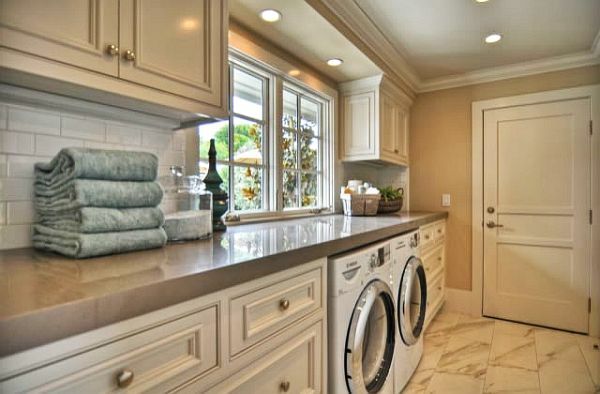 A first-floor laundry room can serve as a command center—a nook near the family room, where parents can keep an eye on the kids while folding, or off the back door, where it can double as a mudroom, home office, or hobby area. On the second floor, stackable, whisper-quiet front-loaders can tuck into a hall closet, just a balled-up-shirt-toss from the bedroom. A utility sink multitasks as a hand-washing station, a place to soak soiled sports gear, even an area to pot plants. Hanging racks provide a place to air-dry delicates and hang shirts straight from the dryer. Choose a steel bar, a retractable clothesline, or a fold-up rack. Counters of varying heights suit different jobs. A raised surface atop front-loaders is perfect for folding, while a 36-inch height is the norm at a sink. Cabinetry can hide detergent and cleaning supplies, as well as an ironing board, pull-out hampers, and sliding utility rails. Water-resistant materials, such as concrete counters and stone floor tiles, are durable and easy to clean. A laminate top and ceramic tile are thrifty alternatives.